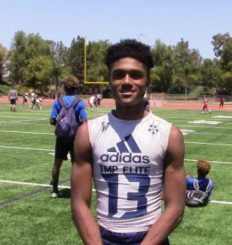 One of the most intriguing prospects from the Oregon Ducks 2018 recruiting cycle is Inderkum High School wide receiver Isaah Crocker from Sacramento, California. Crocker also played basketball in addition to starring on the football team for the Tigers. A Top-300 recruit and a consensus 4-star performer, he played primarily wide receiver. However. he also found success returning kicks and playing defensive back. Crocker, who was ranked the No. 33 wide receiver in the country and the No. 26 player (247.com) at any position in California, put up some impressive numbers while playing varsity his sophomore, junior and senior years. According to Maxpreps.com, he averaged an eye-opening 27.3 yards-per-catch and 25 touchdowns in 34 career games. Crocker has been listed at 6-foot-1 to 6-foot-2 and approximately 170 lbs. by a number of sources. He was active on the camp circuit, so there is ample information about his Triangle Numbers (height, weight and speed). The recruiting website ESPN.com lists him at 6-foot-1 and 163 lbs., while Hailvarsity.com lists him at 6-foot-2 and 175 lbs. He participated in at least one sanctioned event where he was officially measured and tested, at Nike Football’s The Opening Regionals (Oakland) on May 21, 2017 and he was 6-foot-1 and 163 lbs. There is no information available as to his arm length. However, a similarly-sized athlete’s arms should be 31″ to 32″ long. 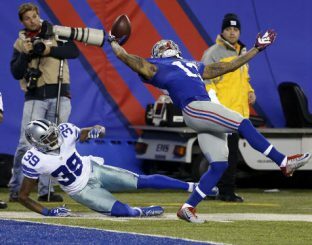 I’m guessing that his hand size is approaching 10″ which is what Odell Beckham, Jr. measured at the 2014 NFL Draft Combine. The reason I say this is that we have all seen Beckham “wind-milling” (one-handed catches) in the back of the endzone during pregame warmups. Here is a video of Crocker doing the same thing in an interview. It not only requires “sticky hands” and athleticism to do this … it takes Big Hands to do it as well. And, like Beckham, he makes it look easy. In an interview with Ryan Wright of the RecruitingNewsGuru.com on May 4, 2017, Crocker claimed that he ran a “4.5 flat” 40-clock. His speed was documented at The Opening Regionals a few weeks later when he was tested for Speed, Power, Agility, Reflexes and Quickness (SPARQ). He clocked a 4.58 40-yard dash as part of a total score of 96.60. The benchmark for a great athlete is acknowledged to be 100. An elite athlete is 115-125. And anything over 125 is very rare and is considered a “freak” of nature. Isaah Crocker has the frame (6-foot-1) to play on the boundary or in the slot. He has a fluid, easy stride and flashes his athleticism throughout his route tree. He is a field stretcher (27.3 yards average per catch), and can climb the ladder and pluck the ball away from his frame. He has plus body control and can contort his frame to create a catch radius you would expect from a much longer athlete. In the video above, Crocker high points the ball as a sophomore. You see him do this consistently throughout his career in high school. Above, Crocker returns a kickoff for a touchdown during his sophomore season. He is creative with the ball in his hands. He can jump step and bounce from gap to gap and has the vision to see the lanes in the open field. He demonstrates impressive vision and the talent to exploit the seams, which you see in game-breakers. In this clip, Crocker returns a punt as a junior. He demonstrates the ability to run through arm tackles and finishes the play nicely. Crocker flashes his catch radius in the video above. Whether contorting his body while climbing the ladder or extending out over his skis, Crocker creates a huge radius and “big windows” for his quarterback. Crocker makes something out of nothing on a screen pass above. A nice jump cut and the ability to gap bounce into open lanes separates him from less talented kids. Great vision in the open field. Crocker picks up more Yards After the Catch in the video above. He appears equally comfortable sifting through defenders or moving out in space. Crocker scores on a 30-yard pitch & catch. He plucks the ball out away from his frame, snatching the ball with strong hands. Crocker plucks the ball at the goal line on a go route. He displays great athleticism on go routes at the third level. Again, he flashes strong hands that prevent “tomahawk” pass break ups (PBU). Crocker demonstrates his ability to separate and climb the ladder. He highpoints the ball and contorts his body, flashing his catch radius. He comes down with a wide base, ready to add to his YAC instead of being satisfied with just making the spectacular catch. In the video above, Crocker again shows his fluid separation and makes the catch in the corner against an elite-level defensive back. An impressive catch radius and strong hands turn 50/50 balls into 70/30 for him. Odell Beckham, Jr. of the New York Giants. Beckham was taken in the first round of the 2012 NFL Draft from LSU. The similarity between Beckham and Isaah Crocker in terms of productivity and how they were used (WR, RB, PR/KR) is remarkable. Their recruiting profiles are also similar. Physically, Crocker is a little taller with a lankier build, while Beckham is twitched up just a shade more (3.94 Shuttle). They share a 38″+/- vertical jump and an unusually large catch radius because of their plus body control. They both highpoint and pluck 50/50 balls and make them 70/30 balls. They flash big hands and the athleticism to “wind mill” catches away from their frame. 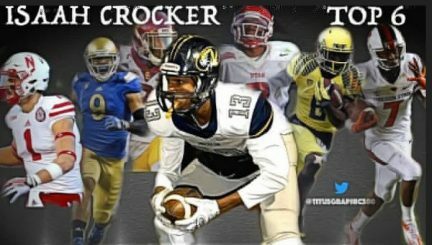 Other athletes who Crocker is similar to: Will Fuller, drafted by the Houston Texans in 2016 in the first round (No. 21 overall); Keenan Allen, drafted in 2013 by the San Diego (Los Angeles) Chargers in the third round (No. 76 overall); Rashard “Hollywood” Higgins, drafted by the Cleveland Browns in 2016 in the fifth round (No. 176 overall); Allen Hurns, who played collegiately at the University of Miami and was signed by the Jacksonville Jaguars as an undrafted free agent in 2014. He currently plays for the Dallas Cowboys. And, finally, Sterling Shepard, drafted by the New York Giants in 2016 and taken in the second round (No. 40 overall). Isaah Crocker has a frame that projects to either the boundary or in the slot. One of his strengths is a huge catch radius because he has the ability to contort his body in space. In addition to that, he plucks the ball away from is frame with strong hands and sticky fingers. He flashes the ability to highpoint and times his leaps to turn 50/50 balls into 70/30. He has a nice fluid stride and the athleticism to track the ball to both sides equally well. He’s competitive and focused while making difficult catches look easy. I saw little on his film to draw any conclusions about his route tree. We don’t know if he rounds off his routes or if he works back to the quarterback on a comeback or hitch. Can he sink and square off when he anchors at the second level? Is he slippery and difficult for a cornerback to force out of bounds? Minor issues regarding route running are correctable with coaching, as no kid coming out of high school is a “finished product.” However, there is a lot to work with here. Crocker is an explosive athlete who demonstrated remarkable consistency during all three years as a starter in terms of production. His 31.3, 24.1 and 30.3 yards per catch average as a sophomore, junior, and senior is astonishing considering he was the focal point of his team’s offense. 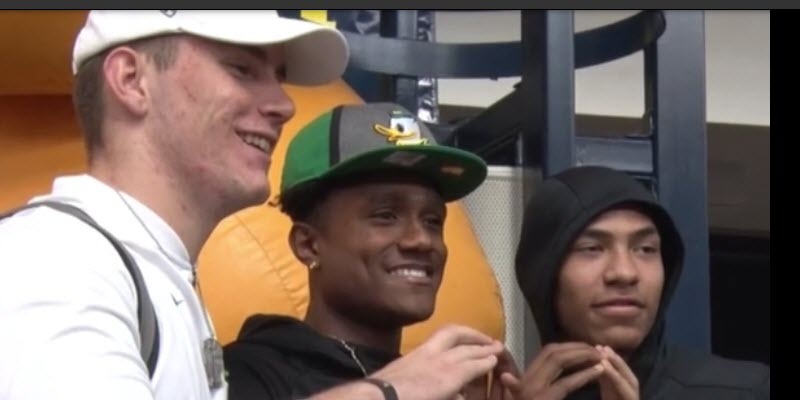 Crocker should see the field early in his career at the University of Oregon. He clearly has the talent to be one of best-ever receivers at the school. He has All-Conference ability and a very high (NFL) ceiling.